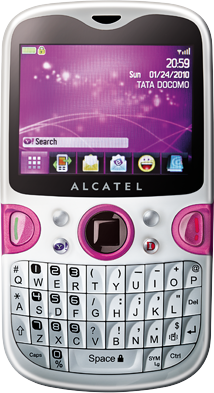 ALCATEL OneTouch Net on Tata Docomo is a real steal as it comes in the market for a sub Rs. 6,000 price! It has many features including a Y! Key which allows you free access to services such as Yahoo! Mail and Yahoo! Messenger for free on Tata DOCOMO. You can also access Tata Docomo Dive In services through the phone. Tata DOCOMO has also introduced some exciting offers for its Prepaid and Postpaid users who opt for the handset. Prepaid user’s will get a special Y! Offer where they will get access to Yahoo Mail and Messenger free for lifetime along with Free 250 MB/month for a period of 1 year. Local On-Net calls will be a 1p/6secs after 1st minute at default rate while other local and STD calls will be at 1p/sec. Postpaid users can choose between two plans; Rs. 199 and Rs. 299. While the Rs. 199 plan will give the user 300 local & STD mins free, the Rs. 299 pack will give its user a whopping 600 local & STD mins free! The local & STD call rate will also stand at 1p/sec. The postpaid users will also get an exclusive Reebok watch worth Rs. 2,499/- when they purchase the handset on a Postpaid connection. Also note down the ‘access code‘ mentioned below as that’s your ‘Gate pass’ to the contest! Note : I am giving away this contest code for next 7 days. Keep you eyes on this contest and grab the phone. Simply answer 3 simple multiple choice questions, in the shortest time possible and win a brand new ALCATEL OneTouch Net phone, with free Yahoo! Mail and Messenger only on Tata DOCOMO. Asus Zenfone AR Review: Are its Features Worth the Price?